A sure creeper, this one. Like draping yourself in a comfortable blanket for a long, cold hitchhike on a deserted highway to eventually discover the fine contours of the blanket's design that had been staring you in the face all along. Wife of American singer-songwriter, Michael Penn, Aimee's similar brand of Beatlesque folk/rock sings of truth and the stark realities we all face, plus some that only a few of us face, like the warning signs of experience in 'This is how it goes'. She seems quite content in this autobiographical tale of record business treachery, seeming to prefer the submissive role of mentor to the up and coming as opposed to fighting the fight anymore herself. And indeed, what's the point? With the freedom to release her albums on her independent label, Superego, she's luckier than a lot of singer-songwriters and she knows it. She's a better writer than a lot of them too. Her talent with a lyric shows no sign of flagging as long as she's writing songs like 'Invisible ink'. Here she sings of just shutting her mouth after being forever misunderstood or even not listened to. "I feel like a ghost who's trying to move your hands over some ouija board/In the hopes I can spell out my name". But she remains philosophical; "I suppose I should be happy to be misread/Better be that than some of the other things I have become". Aimee Mann makes her points with concise intelligence. She even recognizes when she self-indulges; and if you will allow me to for a moment, I feel the last five lines of the closing track 'It's not' to be worthy of quote. "So baby kiss me like a drug, like a respirator/And let me fall into the dream of the astronaut/Where I get lost in space, that goes on forever/And you make all the rest just an afterthought/And I believe it's you who could make it better/But it's not/No it's not". That song passes the lyric polygraph if I ever saw one. 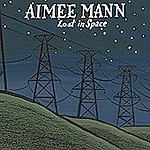 The unfortunate situations described in these songs all have a silver lining after Aimee's wisdom pulls them to pieces. I've read elsewhere that this album is depressing; take it from me, 'It's not'.